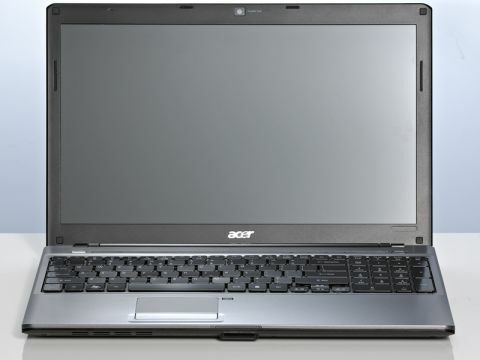 Though the Acer 5810T boasts a large 15.6 inch screen, its light and thin build means that you won't be bogged down by this laptop when you're taking it out and about. The 5810T's body is an attractive metallic grey made out of plastic that while sturdy, is light enough to keep the weight of the laptop to around 2.4 kg. The big feature of the 5810T is the large battery life. Acer is keen for this laptop to be used for 'all day computing'. Whilst it won't manage a whole day of heavy use away from a power supply, the 5810T can manage around seven hours – which is still a fantastic length for a laptop's battery life. Performance wise the laptop runs Windows Vista Home Premium smoothly, though a few programs became unresponsive during our test. Most of the time running multiple programs at once barely made it pause, thanks to the 3GB of RAM that comes with the machine. Although it can't run the latest and most demanding games, it will certainly manage recent games on medium graphical settings. Media playback isn't a problem, with the built-in speakers offering pretty good sound. Video playback, both standard and high-definition – was very good, with the images reproduced clearly on the decent screen. The 5810T comes with a HDMI output, so if you have a high-definition TV you can play your video files though that. Although this is hardly an essential feature, it's certainly a nice one to have, and adds to the overall value of the laptop. Acer has been generous with the other outputs as well, including four USB 2.0 ports, VGA monitor port and a wired network port. Wireless networking is built into the laptop, so you can surf the internet throughout your house. A DVD RW multi drive rounds off the features set – though with the HDMI port it would have been nice to have a Blu-ray drive included. If you are going to be using the Aspire Timeline 5810T for work, rather than play, then you will find the full sized keyboard - with number pad – comfortable to use for long periods of time. The flat keys on the keyboard initially take some getting used to – at first it feels a bit like typing on Scrabble tiles – but the keys are nice and big, letting you type fast if you're in a hurry. The track pad for controlling the cursor on screen has nice multi-touch functionality, giving you some of the cool features (such as dragging your two fingers apart to zoom in on an image) that are usually found in high-end touch-screen monitors. Overall this is a nice, reasonably powerful laptop, whose light weight and large battery life means it is a great companion for working on in the great outdoors.